These photos were taken by me, Fred Bruenjes, at the 2005 Edwards Air Force Base Open House and Air Show. 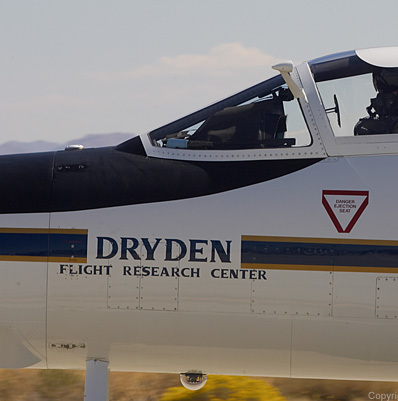 Edwards is also the Air Force Flight Test Center, and is where virtually all new U.S. aircraft are first flown. It is located on dry lakebeds in the middle of the desert which give plenty of space for test flights. Space Shuttle Discovery landed here back in August, when weather in Florida was bad. A pair of Boeing Stearmans circled the flight line before the official start of the show. After passing through security, the first thing everyone saw was the V-22 Osprey. NASA's Shuttle Carrier Aircraft was on display, here's the inside where technicians can hitch a ride. 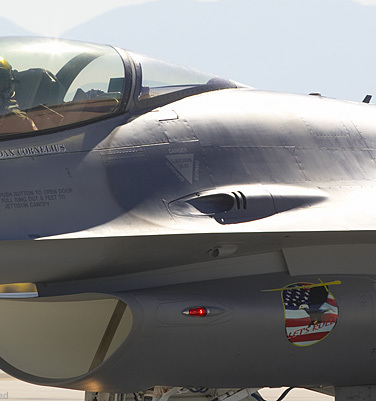 ...while Joe Engle screamed high overhead in an F-16, breaking the sound barrier. The first performance was by the Army Golden Knights parachute team. Next up was the F/A-22 Raptor. 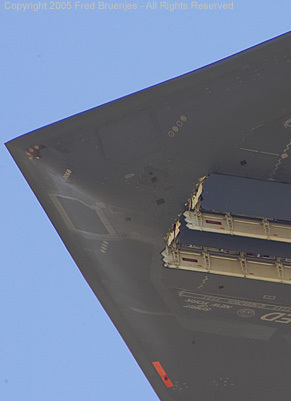 Missile bays open! I believe this is the first time the bays have ever been opened in a public flight. 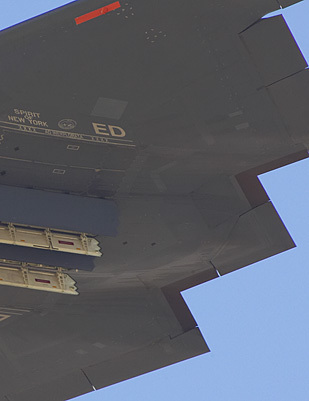 The C-17 Globemaster III demonstrated a cargo pallet drop. 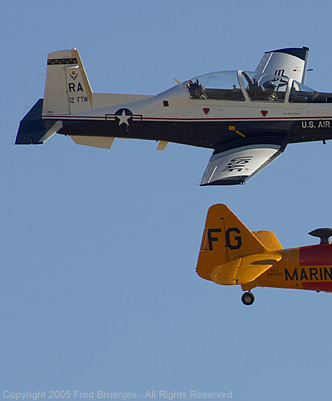 An aerobatic demonstration in a homebuilt Giles G-202. MiG-15 being chased by F-86 Sabre. A special treat was an F-16 demo by the Dutch F-16 demonstration team. I was very impressed, he put the plane through maneuvers I had never seen before. 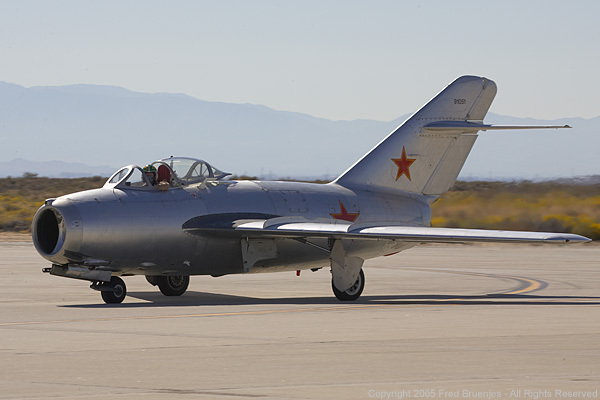 Greg Medford in the Nanchang CJ-6. The Collings Foundation's F-4 Phantom, the only one in private ownership. Bret Willat in Sailplane Magic. 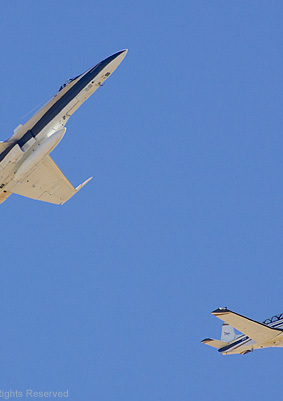 NASA's F-15 ACTIVE aircraft was heavily modified for thrust vectoring research. NASA F-18 Hornet and T-34. Simulated bombing by the B-52. 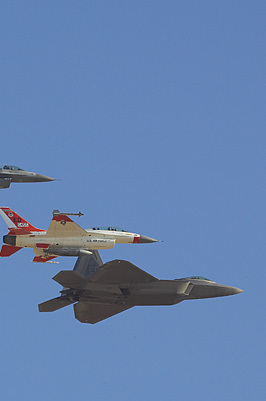 Next was the 'normal' F-16 demo, by an American pilot. Julie Clark in her T-34. Julie flies a pretty daring performance! 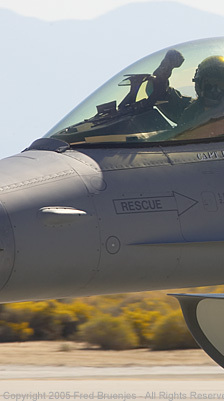 Closeup of nose art on a B-1B. 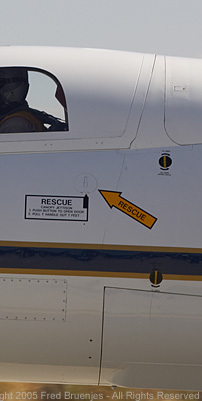 T-6 Texan II training aircraft. 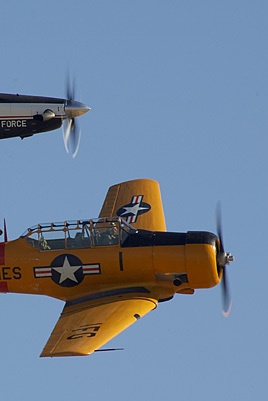 The Texan II in formation with its' predecessor, the T-6 Texan. 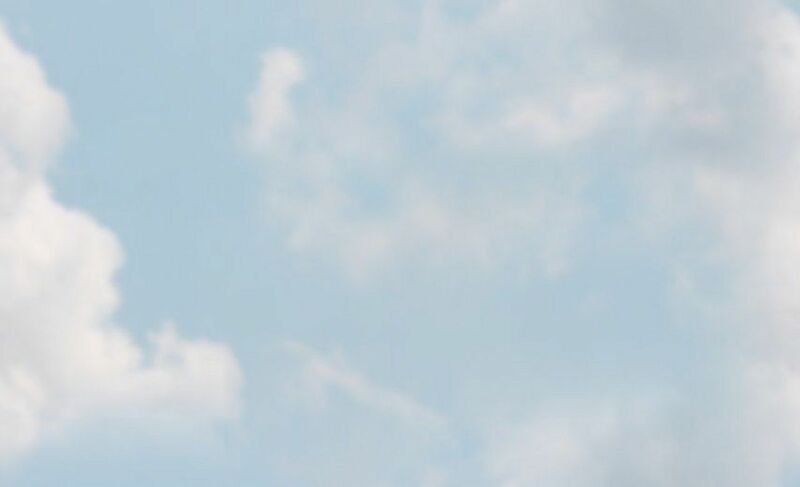 B-2 Spirit Stealth Bomber Spirit of New York. The Edwards pilots fly a much more interesting demo than the simple B-2 flybys at most air shows. Now for a really special treat: this F-117A Nighthawk Stealth Fighter was repainted with the American flag. 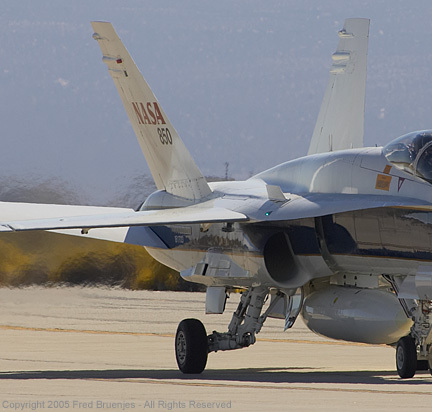 This aircraft has completed its' flight test career and will be relocated to Holloman AFB. Tora Tora Tora is a nine ship recreation of the Japanese attack on Pearl Harbor. Extensive pyrotechnics complement the swarm of replica aircraft. This pilot was having too much fun, flying through the smoke ring from a large explosion. B-2, KC-135 tanker, C-130, C-17, B-52, B-1, F-117, F-16, F-16, F-22. KC-135 Tanker - check out the colors on the boom! MC-130E Combat Talon I cargo plane. 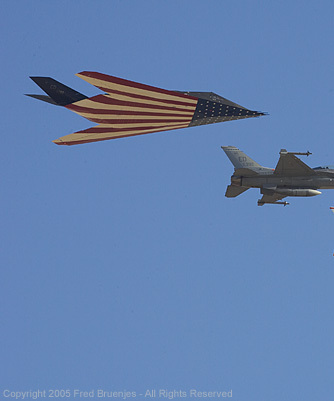 F-117, two F-16s, and the F-22.